When you want it all, you want the Minolta DiALTA Di351f. 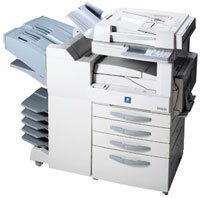 It adds high-speed fax capabilities to powerful 35-ppm print/copy output that makes all your documents move faster. Super G3 fax capability lets you transmit a page in less than 3 seconds. You'll have convenient fax features like 500 Auto Dialing locations and large memory capacity that stores up to 1,400 fax pages. And Minolta's next-generation Micro-Toning High-Grade (MT-HG) System gives you superior 600 x 600 dpi resolution. You can finish documents in-house more quickly and easily with optional duplexing, sorting, stapling and hole-punching. And the optional Pi3502 print controller lets you scan originals and copy or print documents directly from your desktop PC or Macintosh. of less than 70 seconds and first copy in less than 4.6 seconds. by making multiple copies from a single scan. time a job of the same type needs to be copied. Duplexing Document Feeder with 50-sheet capacity copying for 1-sided and 2-sided originals. tray, 550-sheet fixed cassette and a single sheet bypass). hole-punching options that make the Di351f ideal for a wide variety of document needs. and Scan to E-mail along with PS level 3 are optional upgrades.